Let me tell you a little story about my eighth birthday party. There I was, newly-turned-eight, running around an arcade with my best friend and eating pizza that had been sitting out a little too long and ice cream that was more sticky drips than iced goodness. Now, my best friend was way cooler than me. I was the quiet one; she was the fun, outgoing one. Everyone liked her, she was athletic, she always had the fun ideas, and, most of all, her parents let her do all the things I wasn’t allowed to do. She was just that cool. So, all of the stale, chewy pizza is consumed by a room full of hyper seven- and eight-year-old girls, and it’s time to open presents. My little heart was about to burst with excitement. I tore open the first present--from my best friend, of course--and lo and behold, it was a beautiful, new VHS tape of the new movie I kept hearing kids talk about at school. The one my parents wouldn’t get for me to watch, lest it be inappropriate. It was, of course, Shrek. I went home, I watched it, I loved it. I watched it again. And again. And again and again and again until I could quote the entire thing from memory, prompting my cousin to make fun of me as I mouthed every line along with the film. I got older. I understood more of the jokes. I loved the next one. And the next one. I mean, Eric Idle and John Cleese? Justin Timberlake as whiny, high-school-aged Prince Arthur? A literal punk-rock princess and a Zorro cat? Mutant dragon-donkey babies? Random musical numbers? The whole franchise was just perfection. A great voice cast, one-liners that just kept coming, real-life situations in a whimsical, parodied setting. I loved all of it. And so, when they announced that they were going to come out with a fourth movie, Shrek Forever After, I was understandably ecstatic. It was one of the biggest cinematic let-downs I’ve ever experienced. It’s right up there with The Lobster and the new MacGyver series and the fact that they’re talking about making a Top Gun 2. Haven’t they learned? You don’t mess with perfection. For those of you who haven’t seen it, or, like me, are pretending it doesn’t exist, the plot goes as such: Shrek is going through a midlife crisis at his children’s first birthday party. He meets Rumplestiltskin and trades a day of his childhood for a day of living like a “real ogre.” Things, of course, go terribly awry. First and foremost, rewriting history is a cheap and lazy plotline. Don’t get me wrong, it can work, if it’s necessary. And done well. Like Days of Future Past. Or It’s a Wonderful Life. But as a general rule--especially in a series--it’s what happens when a writer runs out of other, better ideas. This deal with the devil has been done far too many times for this unoriginal plot to work, and what was the point of my spending three movies getting invested in all the characters only to have them all rewritten in the final installment? Plus, this Rumplestiltskin is just a bad villain. He’s irritating and fairly useless. I can’t even applaud his scheme because I just don’t like him. Second, the entire movie is essentially Shrek throwing a hissy fit, then regretting it. Not a super compelling or involved story arc. They rewrote every character as an opposite for… what? Humor's sake? Because it wasn’t funny. It was a waste of time, money, and effort. Third--and this, might I say, is by far the most important thing I hated about this movie--I had a much better idea for the plot. And I’m angry it didn’t happen, at least in some capacity, because it seemed the natural next step in the Shrek saga. So, the end of the third movie leaves a teenage King Arthur in charge of a recently ransacked Far Far Away. Supposedly, Prince Charming was crushed by the falling tower, but I don’t buy it. Haven’t you people ever heard of foreshadowing?? The beginning of the film shows Charming performing in a dinner theater, disgruntled and swearing revenge. The show goes sour, the fake tower falls, and Charming is left crouching in terror as it’s shown that he made it through the window opening. As the tower falls in the climactic scene, we see the window falling toward him, much like it did in the beginning. He’s totally still alive, and he hightailed it out of Far Far Away to rebuild an army. Vengeance will still be his. And you know who we haven’t heard from in a while? Duloc. There is a city, king-less, filled with quasi-Disneyland worker bees who love a good brawl, ripe for the put-out-prince plucking. It’s also, conveniently, a nigh impenetrable fortress. Naturally, as Charming was hightailing it out of Far Far Away, he should have stumbled into Duloc. He could’ve easily won over the people, used the resources, and mounted war on Far Far Away and its new, inexperienced, loser king. You see where I’m going with this? We’ve got Far Far Away: Shrek and Fiona would’ve been caught in the middle with their three infant ogres, accidentally catching things on fire. They have a dopey old wizard who’s still fairly effective, plus a whole host of badass princesses. They’ve got the townspeople with pitchforks and torches. They've got a dragon. And now, they’d have at least half of the former villains. And then there’s Duloc: the ever-persistent Charming would now have a fortress, a dueling ground, and a kingdom. He had time to train people, people who are already used to a bad ruler. Probably half the villains would’ve switched back to his side, leaving room for a whole host of new fairy tale or mythological creatures. He could’ve found Cthulhu. And Nessie. Or Davy Jones. Maybe a celebrity or two. I would’ve 100% watched and loved the heck out of that movie. Anything. Literally anything would’ve been better than the disaster that they called Shrek: The Final Chapter. Not making it would have been better. I have it on good authority that a Shrek 5 is going to be released. Because why wouldn’t it be? That being said: if this somehow gets in front of somebody important at DreamWorks, and if you’re still looking for ideas, consider mine. Please. I’m holding out my last few hopes for you, Shrek 5. Please don’t disappoint. 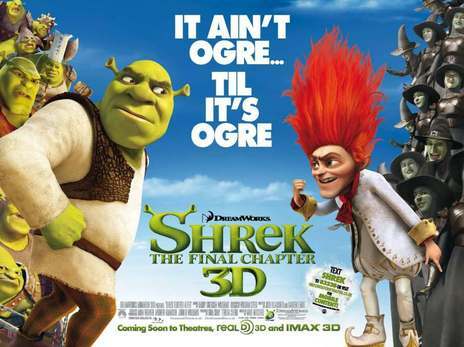 What did you think of Shrek 4? Are you hoping for anything from Shrek 5?